Embrace our brokenness? That sounds like the dumbest thing we could do after all we live in a fix-it society and not only that but if it can’t be fixed we toss it out and get a new one. But Paul writes, “Instead, God has chosen what is foolish in the world to shame the wise, and God has chosen what is weak in the world to shame the strong.” (1 Corinthians 1:27, HCSB) In other words “It ain’t broken until God says its broken.” God is not the ultimate Mr. Fix-it, God is the ultimate one who transforms. But how do we embrace our brokenness rather than trying to fix it? The first lesson I learned (the hard way) is not to run away, yet don’t bury it either. I am currently taking a new medication for pulmonary fibrosis called Esbriet it’s what I consider an “embracing drug” since pulmonary fibrosis cannot be fixed all Esbriet will do is to stop for slow down further scaring of my lungs, it is medical science’s help in embracing it so I can get on with life. Since day one in the summer of 2011 I extended God the invitation to embrace it with me and now I am free to get on with my life. 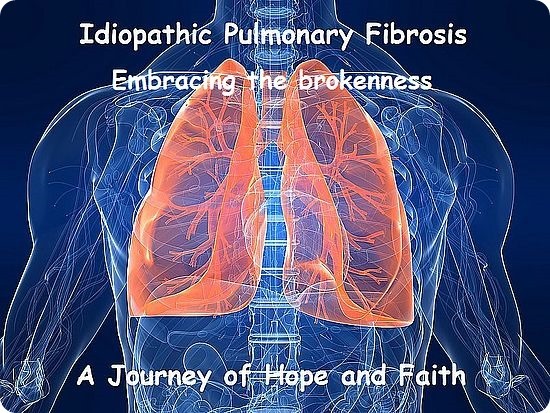 Do I want the IPF to be fixed? You bet I do! At the same time I extended an invitation to God to fix it as well but like he said to Paul, “My Grace is sufficient for you,” he said to me as well. I soon discovered that God’s Grace keeps on supporting, and supporting, and supporting, and supporting, and you know what I’m talking about. And here’s the lesson for you — What God did, is doing, and will do for me He will do for you! Believe! Embrace your brokenness and invite God! Experience a God Embraced brokenness! And be Energized by it! *Kraft, A. (2011). Good news for those trying harder. Colorado Springs, CO: David C Cook.